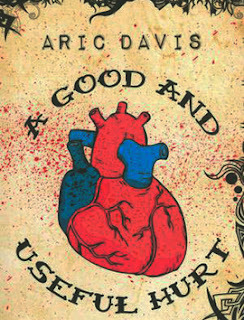 Aric Davis knew that he was going to be tattooed long before he thought about becoming a writer. And it was with this passion in mind that he started to write his third book and second novel, A Good And Useful Hurt. What he delivers instead is something more than anyone expected. A Good And Useful Hurt is more than a second novel. It's a must read supernatural thriller and contemporary love story on the societal fringe. A Good And Useful Hurt sends bittersweet shivers and permanent chills. The likable protagonist, Mike, is a tattoo artist who owns a studio. It's not his first attempt, but one of several after a series of failures due in part to his own lifestyle choices and attitude. Nowadays, things are different. He has matured as a business owner with a passion for art, but tattoos happen to be his medium of choice despite the stigma associated with it. The shop is busy enough to staff a piercer; a receptionist, Becky; and a second tattoo artist, Lamar, a young black man who spent most of his youth in a juvenile detention center before coming to work at the shop about five years earlier. Lamar proved his mettle as an apprentice quickly enough, once the two had worked past a subconscious color barrier and connected because of their mutual respect for each other's work. But the real test of their developing friendship came a few years later. When Mike returned to his studio apartment above the shop after work one night, he discovered his soon-to-be ex-girlfriend Sid had shot herself in the head rather than move out. She did this in the bathroom, a final act of defiance meant to teach him a lesson that she would not leave so easily, not ever. Although the relationship had come to an end because Sid could no longer manage her drug addiction and depression, Mike still loved her. At least, he loved her enough that he'd often question whether he was right to avoid marriage after his first ended so badly. When his piercer quits over a salary dispute, Mike interviews Deb, an outspoken redheaded firecracker and piercer whose portfolio — piercings along with scarification, body implants, branding, and mutilation — far outweighs her abrasive attitude. Lamar sized her up differently. She's crazy, he said. Two other primary threads that needle themselves into a rich tapestry. Mike, Lamar, Deb, and Becky aren't the only ones to be introduced early. The first is Wes, who never wanted a tattoo, but requests that the ashes of his dead son to be added to the ink. And while Wes plays only a bit but memorable part, he refers more people to the studio, all requesting the same thing after he experiences something that lifts his spirit. The second person, Phil, doesn't have any interest in the studio. He is a serial killer, someone who developed an insatiable vengeance against women, picked up on as he stalks a young single mother and her infant. And while the introduction of Phil and ash-laced tattoos are alluded to as the conflict and the solution, it's everything else that happens to set a stage that becomes addictive, entertaining, and effortless. There are other characters too, each with varying degrees of importance but all of them well fleshed out and complete. It's part of the life that Davis breathes into the novel. Life happens around the story rather than the primary plot becoming all encompassing until absolutely necessary. A little bit of background that adds believability to the story. Although his background sometimes overshadows the merit of his work, Aric Davis is adept at creating a convincing environment because he lives it. 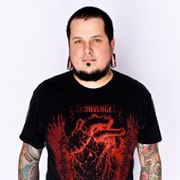 He has worked for fifteen years as a body piercer and sports more than one tattoo. He also enjoys writing, enough to write columns from time to time too. He has also seen ashes tattooed into skin. He dedicated the book to young women who were murdered near his home. And he is unafraid to make keen observations about society, ranging from the prejudice against people who look different to the emphasis placed on murderers while the victims are forgotten. Davis currently lives in Grand Rapids, Michigan. He has a wife and daughter. A Good And Useful Hurt By Aric Davis Inks 9.5 On The Liquid Hip Richter Scale. A Good And Useful Hurt isn't perfect, but it comes close. The story feels a bit rushed to conclusion toward the end, with the likely intent to carry the story toward its crescendo. And while the interjection of the serial killer perspective now and again sometimes feels disruptive, the reasoning makes more sense by the end. But otherwise, there isn't much to improve upon but there is plenty to love. Published by 47North, the latest imprint from Amazon Publishing, Davis represents a growing stable of writers who might never have otherwise pursued a literary career. A Good and Useful Hurt can be found on Amazon. The novel can also be found at Barnes & Noble. Although the book could not be found on iBooks, the audio version is on iTunes. It is brilliantly read by Luke Daniels, who brings every character to life vividly.